Oceanfront Grand Pavilion Home! Prime Location! Community Pool Access! One of the most popular areas in Wild Dunes, 64 Grand Pavilion is a great place for a beach getaway for any large group of travelers! A classic three-story, beach style home, this spot is the perfect location to make the most of what the Resort has to offer. The spacious living area makes getting around the house a breeze and allows plenty of room for everyone to gather together. 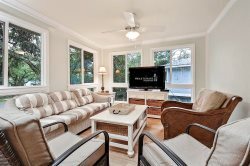 The living room sports comfortable furniture, a pool table, and has access to the first level oceanfront deck. The dining room, situated right off the living room, has a table and seating for ten as well as extra seating space facing the kitchen countertop. The kitchen has modern appliances and is equipped with everything a guest would need while on vacation. The first floor of the home has one bedroom that has two twin beds and a desk area. There is also a small balcony facing the front of the home. This bedroom only has access to the first floor half bathroom, and would share full bathroom access on the second floor. Moving to the second floor, there are three bedrooms. Two rooms have a queen bed each and private bathrooms, and the third room is the first master suite. It has a King bed, private bathroom with double vanities, a soaking tub, and standing shower, and it also has a private oceanfront balcony. On the top (or third) floor of the home, there are the remaining two bedrooms. One room has two queen beds, TV, small sitting area, and a private bathroom. The final bedroom is the other master suite equipped with a king bed, TV, oceanfront balcony, and private bathroom with double vanities, shower, and tub. With unbeatable oceanfront views, access to Pavilion pools, and dual master suites, it's the ideal location for large families! Book today to visit us at 64 Grand Pavilion! This property has a Wild Dunes SportsCard. This is a club membership to be able to access the Wild Dunes Resort amenities. With this pass, there is access to 4 community pools and the resort fitness center. You must pick up your SportsCard at the Sand and Sea Salon on the Village Plaza (hotel area of the resort).